First up – I was interviewed a while back by Dan Bortolotti, who runs the Canadian Couch Potato blog. 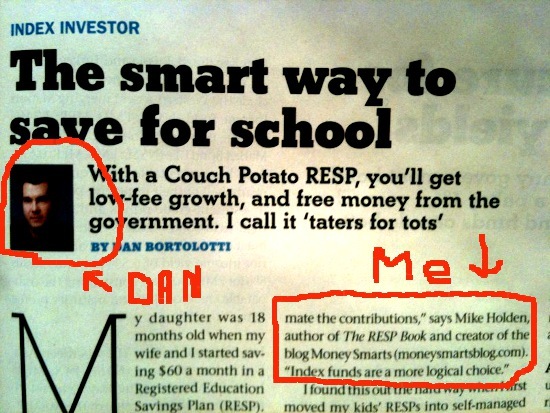 Dan also writes for MoneySense magazine and interviewed me for an article he wrote about couch potato investing in RESPs. MoneySense is my favourite magazine, so it was quite an honour to be quoted in an article. The article is on page 17 of the latest issue and is called The smart way to save for school. I got my copy today and took a picture of part of the article. 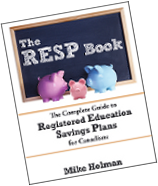 The second bit of news is that Frugal Trader from Million Dollar Journey did an extensive book review of The RESP Book. He is also hosting a giveaway contest which is open until this Friday, Oct 20 at 5 pm EST. Go and enter in the contest. Congrats on the MoneySense mention and thanks for the link! I just got my MoneySense mag in the mail last night. I was pleased to read Dan interviewed you! Umm, what’s your last name Mike?